[Guide] [Quest] [Tutorial: Warrior Welcome!] <+> [MU Online Fanz] <+> Official 3rd-party [MU Online] Fan Site & Game Guide! 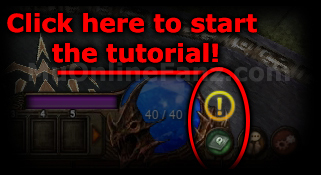 The [Tutorial] is a basic walk-through of the game, offered by NPC [Shadow Phantom Soldier] as a [Quest]. If you have never really played the game before, it gives you good basic information to know. It is really simple, but we have detailed each step below to help! When a new [Tier 1] [Character Class] is created, the [Tutorial] is offered as a quest. 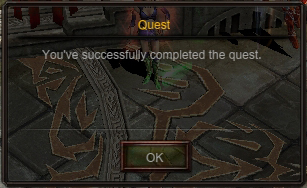 The [Tutorial] can be accepted or declined via [Quest Menu]. 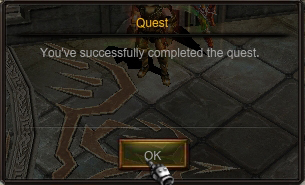 By completing the quest, a handful of extra rewards can be gained. If the quest is declined, it cannot be accepted at another time. If the quest is declined, [Warrior's Ring] and [Champion's Ring] will still be gifted. [Shadow Phantom Soldier] says, "Welcome to the world of [MU]. We have been waiting for a hero like you to arrive and put a stop to the chaos brought on to the MU realm by [Kundun]. However, journeys such as this are bound to be perilous. If you wish, we can provide you with a simple tutorial, What do you say?" [Tier 1] [Character Classes]: [Dark Knight], [Dark Wizard], [Fairy Elf], and the [Summoner]. Two [Quest] [Rings], the [Champion's Ring] and [Warrior's Ring], are the main [Quest] reward. These [Quest] [Rings] can be transformed to receive a random [Normal] equipment item with a high [Item Level]! 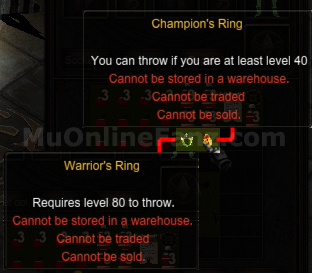 [Champion's Ring] can be used at [Character Level] [Level 40]. [Warrior's Ring] can be used at [Character Level] [Level 80]. To transform the [Quest] [Rings] into items, drop them on the ground in any [Safe Zone]. The [Quest] [Rings] can transform into [Normal] equipment of [Item Level] [+6] ~ [+9], with random options! Select a [Character Class] from above. No [Character Class] is currently selected. 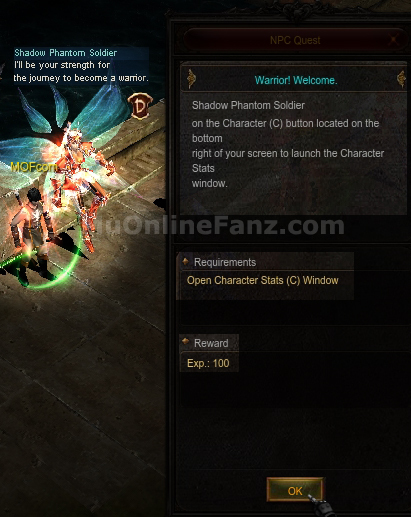 Open you character window by pressing the [C] button. 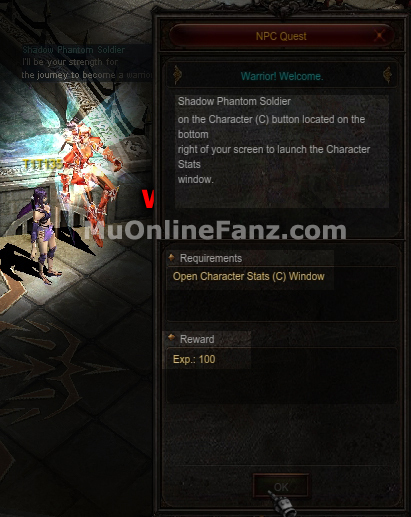 Return to the Shadow Phantom Soldier (SPS) for your reward. 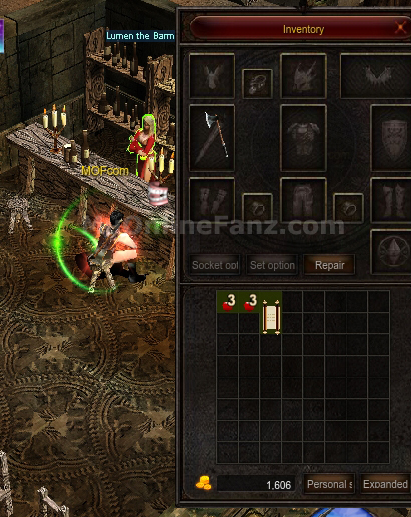 Open you inventory by pressing the [I] or [V] button. Return to the SPS for your reward. Return the apples to the SPS for your reward. Then, return to the SPS for your reward. 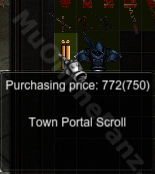 Buy a Town Portal Scroll from the shop. 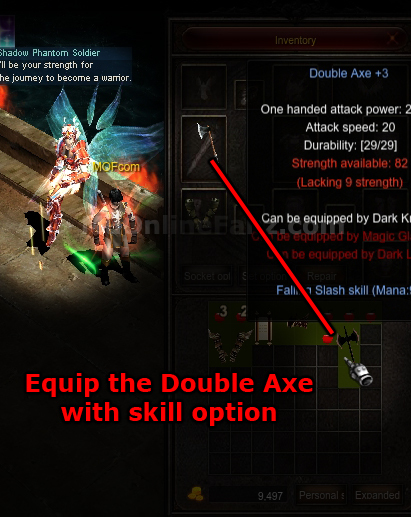 Equip the Hand Axe the SPS has given you. Raise your character's level to 25. How do you trade with other characters? Answer: Press D and select Trade od type in '/trade' in the Chat window. How do you turn off party requests? Answer: Type in /'Request off' in the Chat window. Which button is used to send whispers from the Chat Window? Answer: From the Chat window, use the Tab button. At which level can you repair your own equipment? What is the minimum level you need to be and the amount of Zen you need in order to enter the Dungeon? Answer: Level 30 and 3000 Zens. Whom should you seek out in order to combine items? Answer: The Goblin NPC in Noria. The [Elf] class guide has not been created yet. See the [Dark Knight] walk-through, as it is very similar. The [Dark Wizard] class guide has not been created yet. See the [Summoner] walk-through, as it is very similar. 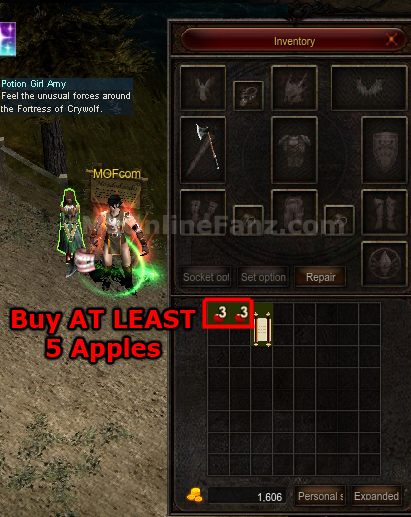 Buy 5 Apples from the shop. 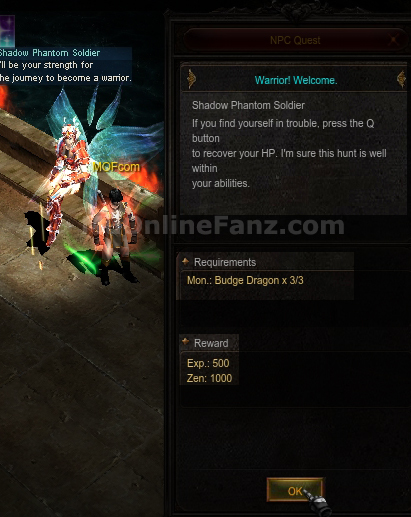 Learn the Fire Ball skill by right-clicking the scroll! 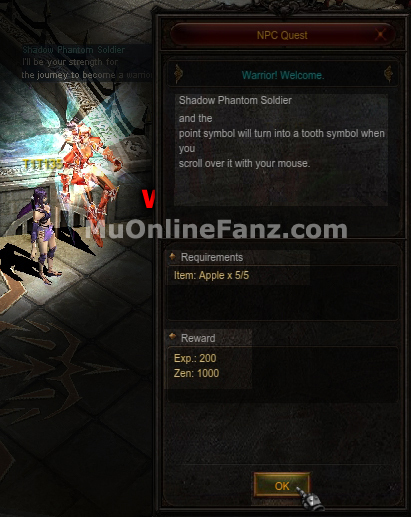 For completing the tutorial, the Shadow Phantom Soldier with reward you with a [Champion's Ring] and a [Warrior's Ring]! Up to (x48,500) [Zen], for [Dark Knight] or [Elf].